Now that football season has officially started and is in full swing, it’s important to watch out for symptoms of injuries. Some of the most common football injuries are those to the back. The nature of the game requires hard impacts, twisting the torso, and other activities that can lead to a back injury. If you do have a back injury from playing football, follow these tips to help you recover as quickly as possible. 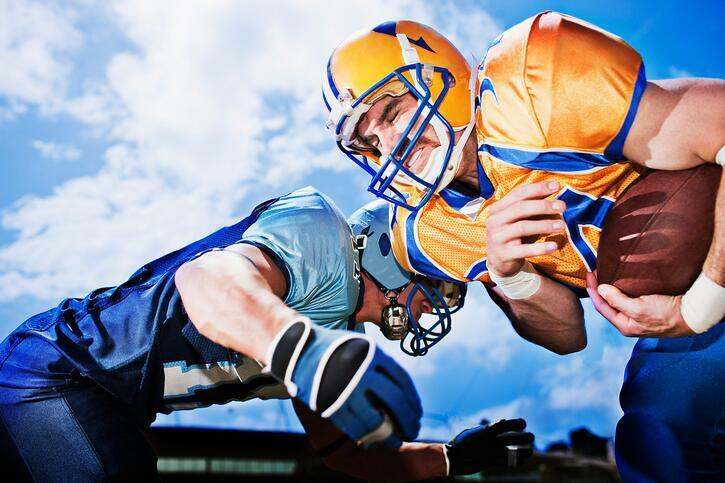 Many football players are familiar with the discomfort associated with a herniated disc. Often caused by a sharp, forceful bend or twist in the back, a herniated disc puts pressure on the spinal nerves. The associated symptoms may include weakness, tingling, or numbness, often in only one side of the lower back or in one leg. If the herniated disc is in the upper spine, the same symptoms may occur in one side of the neck or in one arm. Herniated discs and other types of spinal injuries can be quite uncomfortable, but they don’t always limit an athlete’s ability to perform. However, this is not a reason to continue to play. Treating spinal injuries early and before they worsen can help prevent a prolonged recovery and possibly even help you avoid surgery. Herniated discs are often treated with rest, cold and compression therapy, and over-the-counter pain medication. A doctor might also prescribe a stronger pain medication or steroid injection during times when it is necessary. Pulled back muscles are common in athletes of all types, not just football players. This soft-tissue injury is typically characterized by sudden sharp pain, swelling, tenderness, and limited range of motion. Some people also experience muscle spasms with a pulled back muscle. In most cases, this injury can be treated with rest, cold and compression therapy, and the appropriate pain medication. While it is tempting for football players to “play through the pain” of a pulled back muscle, this may likely only exacerbate the injury and make the recovery process last longer. If you have experienced a pulled back muscle, it’s important to avoid athletic activity until you are fully recovered, even if you are still able to play in the later stages of recovery. Most athletes understand the importance of applying cold and compression after an injury to help control swelling, but many do not realize that these same therapies can be used throughout the recovery process to help the body heal faster. Applying therapeutic cold and active compression at the same time enables cold to penetrate deeper into muscles, tendons, and ligaments, and last longer. This leads to faster healing and the ability to get off the bench faster. However, even with the best attempts at prevention, injuries sometimes happen. Understanding the symptoms and staying committed to a full recovery will help you have a longer athletic career. If you think you might have any of these common football injuries, consult with a physician to get a diagnosis. In addition to any other type of medical treatment you might need, ask the physician about how you can get a Game Ready cold therapy system to help you recover faster. You can also use our provider locator to find a physical therapist or other professional who offers Game Ready near you.